One supposes that if you asked the sign carrier what he/she (can you tell?) 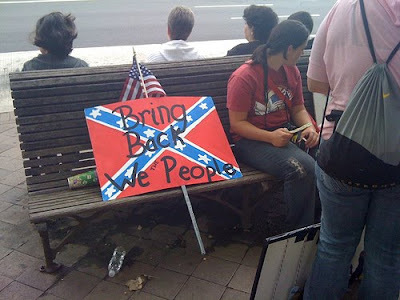 meant by the Confederate flag, he/she (no, really, can you?) 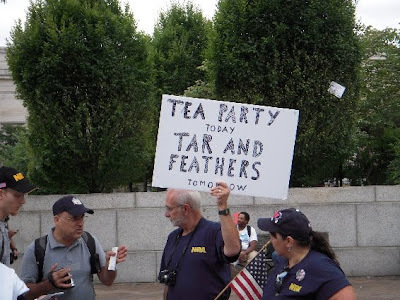 would say it means "state's rights," and that the "people" in the sign are "real Americans." Sometimes, the code is pretty damn easy to break. Good thing there weren't any black people there to see it. 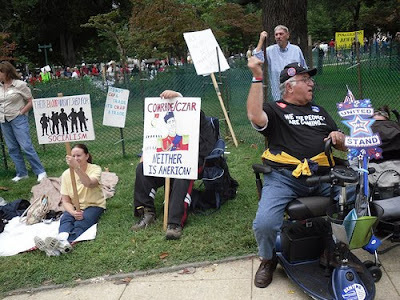 And that rowdy, fat, old man protesting government-run health care is riding around on a scooter that was more than likely 80% paid for by Medicare. Probably that cane he's holding, too. The lesson? Irony is to the anti-health care protesters as calculus is to a gerbil. If, say, the entire gathering had been nerve gassed, the I.Q. of the United States would have gone up by ten points. Is that wrong to say? 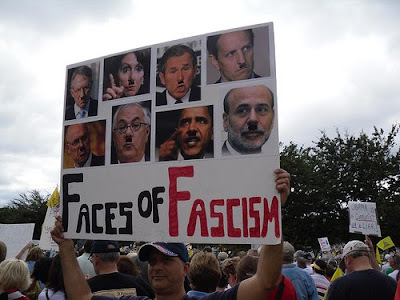 You know, though, considering how many people there were holding Obama-as-Hitler signs and saying, as one guy did on CNN, that the Obama administration is engaged in "Gestapo" tactics, perhaps it's good to offer a remark about what real Nazi thinking is. Gassing a part of the population in order to purify the nation? That's Nazi. A government-operated health insurance program as part of a pool of options for those who can't afford private insurance? That's not so Nazi.